In Big Top Pee-Wee, I live on a country farm where I feed my barnyard animals pancake breakfasts and work on a top-secert botanical experiments with my pet pig, Vance. One day a storm blows an entire circus into my yard! There's wild animals and all kinds of cool circus stuff-especially the trapeze artist, Gina. She's the most beautiful girl I've ever seen! She's the most beautiful girl I've ever kissed, too!! That's probably why my fiancee, Winnie, gets so angry. Let me tell you, one torrid love triangle in a lifetime is plenty for anyone! It all works out great, eventually, and I even get to be in the circus! Sawdust, glitter and excitement-I hope you like it!! 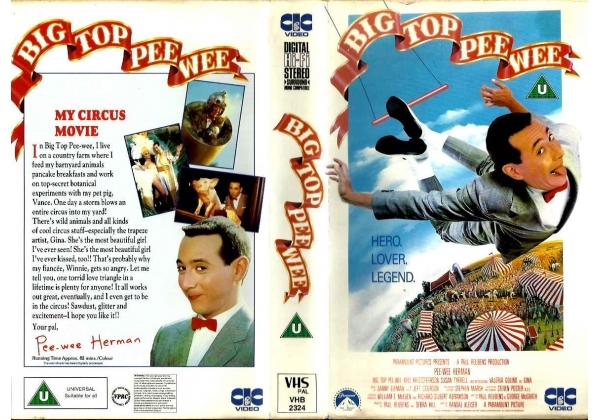 Or find "Big Top Pee Wee" on VHS and DVD / BluRay at Amazon.